Many of our clients have been gracious enough to express their appreciation of our assistance in the form of feedback. Testimonials say a lot about experience of our client with us. Genuine feedback from our clients is shown below. I have been using the Trend Analyser for more the six years and honestly I am a very happy user. The whole product which includes feature rich tools, reliable data, newsletter and amazing support is what makes the subscription worth. I am able to learn, practice new techniques and this makes trading worthwhile. I have the privilege of being associated with Technical Trends since its inception, way back in 1993. I was introduced to technical analysis by the “expert investor” software and the elaborate guide book that came with it. We have been the subscribers with Technical Trends since then without break. The software tools and support guidance have grown ahead of time and demand. The daily newsletter outlining Mr Sukhani’s views on markets are great and very helpful. All the kudos to Mr Sukhani and his team. I have been using Trend Analyser for the past 3 years now and my experience has been “Very Good”. The software features as compared to the rates that are being charged for it are the best in the industry (to the best of my knowledge). The technical team to help you out with the system support is exceptional and are always ready to entertain any suggestions that a user might have. Overall my I would rate Technical Trends 10/10 in terms of system support and 9/10 in terms of the Software Package & Features. I am a client of S2 since more than 7 months. I am very happy with their service. Of course I have made money and lost money but I trust them. Deepak has been most helpful. Varad and Saurabh are also good. They are ready to help you whenever you call them. God bless. My association with the Technical Trends (S2 Analytics now) team goes back to over 23 years. I was among the first users of the software (The earliest avatar was Expert Investor). I have stayed with all the versions of the software and can say without any hesitation that this ranks among the best in the country. I am a subscriber of Trend analyser for more than 10 years. I in this long period I have seen several updates and changes made by S2 Analytics from time to time. Software itself is very unique and very user friendly. Support and service is far excellent and have never seen problem in so long period. Hope very better and bright future for them. I have been using the charting software Trend Analyser for more than 10 years now. I find the same very helpful. also the data that you provide is very accurate & reliable. Your support team is also very good. Wish you the very best for the future. It is great moments in my life that started using your research and charting software for last 3 years. My journey has been profitable and constant learning sharpened my Sword and your analysis strengthened my Armour against volatile markets to stand victorious. It's wonderful to get indepth analysis of markets by world famous technical analyst like you. Hats off. We have been associated with Mr. Sudarshan Sukhani for the past 25 years and he's played a major role in our trading success story. I fondly recall the days in 1993 when he used to send the floppy disc from Delhi to Chennai by courier every weekend, containing the trade data of the previous week. He's adapted and kept up pace with latest technologies and took along all his clients in the wonderful journey. We wish your team all the very best in all endeavours. When I was struggling to get into Technical analysis found out a S2 Analytics since then it is no look back. Knowledge they provide no one can match as on now in India through news letter, DVDs, Videos and transcript uploaded in website. Trend Analyzer gave me a breakthrough now I say I am better analyst it doesn’t stop there promoted me to found a start up called Vishwasit FinServe and Through Vishwasit We are serving 100 odd customer and provided job to 15 Plus young talents. Last but not least their timely service amazed us from last 4 years. Having associated with S2 Analytics for the past 7 years and having used a variety of products being offered by S2 Analytics - I must say, I am a delighted customer, as everything is extremely transparent, exceptional and outstanding. The entire team goes out of the way to help you in any way they can and make you feel at home. Additionally, the trainings, newsletter and catch-ups that happen regularly helps traders be in touch with the latest developments, current market scenarios and enhance one’s trading knowledge. I wish S2 Analytics the best in all their future endeavours! 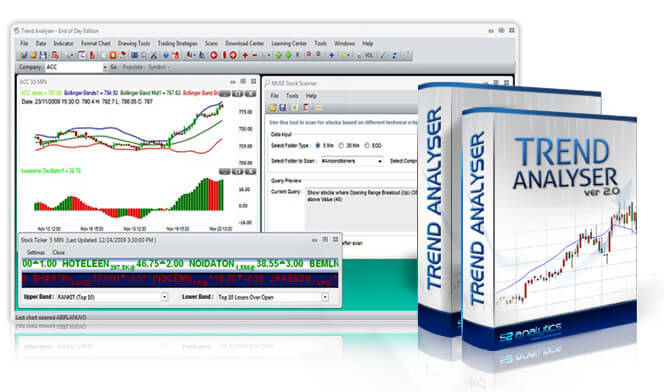 I have been using TREND ANALYZER and TRADE-V from 2009, and i am fully satisfied. 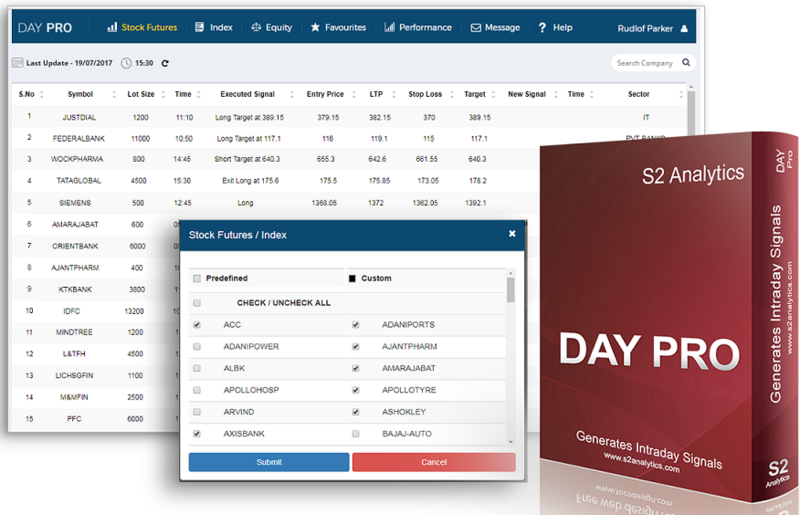 Trend Analyzer is unique software for charting and very easy to use. 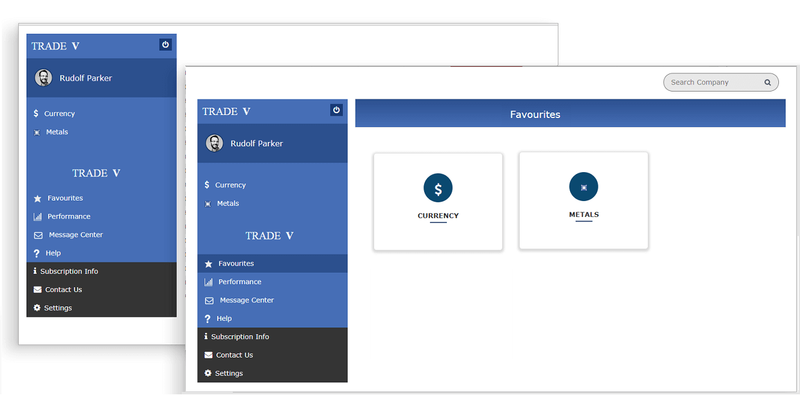 TRADE-V is fantastic software for trader who trade in index and stock futures for short term. Daily newsletter is very helpful to make trading plan for next day.